The new Harry Potter film (And yes, I'm a fan. I've read all the books. I've seen all the movies. And I'm unapologetic for these things) is the most solidly dramatic, mature, and cinematic installment yet. 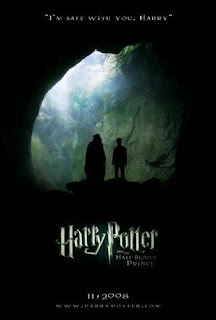 Half-Blood Prince takes a dour tone from the very beginning, focusing on Harry's sadness at the loss of his godfather Sirius, and then powers on, never handing out explanations or details that would damage the dramatic effect of the film. Every scene is dark, or at least emotionally-guarded. It's almost like watching the film through a mist. David Yates delivers another even darker film than 2007's Order of the Phoenix by staying true to the plight of his characters, rather than attempting delight the audience with special effects and nifty screen magic. A lot of people start dying in the 5th, 6th and 7th books, and Yates' films reflect this darkness, complexity and sadness. The film is just plain excellent. There are a few genuinely creepy, J-Horror-style boos that will make you jump in your seat. And all the actors, those kids who are now grown up, are their most confident and real yet. The best bit of casting manifests in Jim Broadbent who plays a meek, self-serving, but ultimately kind Prof. Slughorn with incredible ease. Yates' and his actors greatest accomplishments in these last two films have been taking the whole franchise from one directed specifically at children, reveling in cute explosions and one-off sight gags, to a complex, grown-up, real world laden with troubles. I won't go into detail because if you've read the book you already know about the big "surprises" and if not, you probably already heard. The film features great performances by Daniel Radcliffe, Rupert Grint, and Emma Watson... but especially refreshing was the quiet, conflicted brooding of Tom Felton as Draco Malfoy. Gone are the sniveling brat days, and these actors have taken the mantles of their roles very seriously. And there's a lot of teen angst stuff peppered in there, but never over done without intention. Jessie Cave does a fantastic job as the over-the-top, head-over-heels Lavender Brown. Essentially, this is a movie in which a great story was directed with care and consideration. We can thank David Yates for taking this series where it needed to go to remain relevant, and for making it a lot of fun without compromising the heart at the center of J.K. Rowling's book. Notable addition: A cornfield scene that throws Harry and Ginny together, and provides a little spooky boost of action and fear.